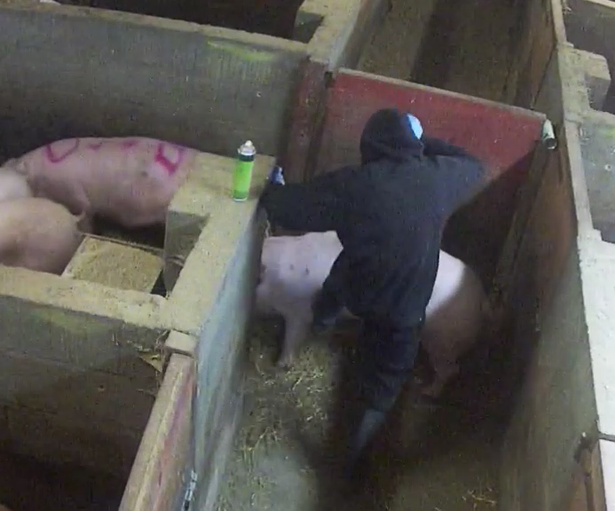 In April-May 2018, Animal Equality - a leading international animal protection organisation - filmed workers on Fir Tree farm in Lincolnshire kicking pigs in the face, jabbing them with pitchforks and slamming gates on their heads. Today, in Grimsby Magistrates’ court, Gavin Hardy pled guilty to causing unnecessary suffering in relation to these acts. Two other workers at Fir Tree farm - Troy Wagstaff and Artis Grogprkevs - pled guilty to the same offence at a previous hearing. All three men will be sentenced on 28th February. The undercover investigation, which came on the back of an anonymous tip-off, revealed multiple incidents of deliberate violence by several workers on the farm which is owned by Elsham Linc - one of Britain’s biggest pig producers - and supplied large retailers including Tesco. “We are pleased that all three of these farm workers have been convicted for their deliberate acts of violence against the vulnerable animals in their care. We now expect them to receive the maximum prison sentence possible for this disgusting abuse” said Dr Toni Shephard, Animal Equality’s UK Director. As a result of Animal Equality’s UK investigations, six farm workers have been convicted of cruelty. In May 2017 a dairy farm worker in Somerset received a 12-week suspended prison sentence after Animal Equality investigators filmed him violently abusing newborn calves and their mothers. In 2012 two workers were filmed beating piglets to death with a metal bar on Harling Farm in Norfolk. Both men pleaded guilty to cruelty charges and one was sent to prison for 18 weeks.